Bushfires flare up across parched Queensland, Australia. The wildfires that struck northwest Minnesota, USA have gone underground, igniting layers of peat that could burn well into the winter. 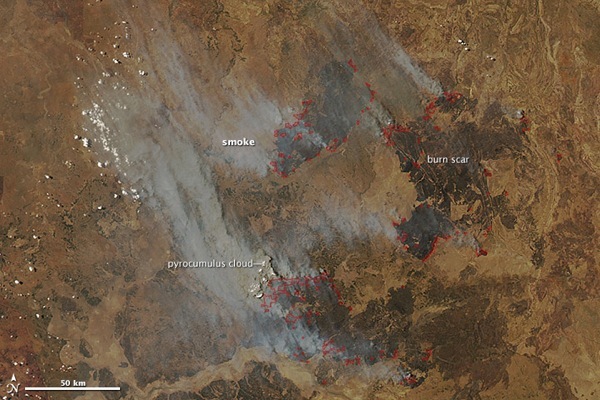 Early October saw intense bushfires blazing in Australia’s Northern Territory in a remote area northeast of Elliott. The satellite image shows the extent of the fires and smoke. Large wildfire burns more than 60 000 ha in the Northern Cape, South Africa. Large bushfire burns in the Gold Coast hinterland, Australia. A one-kilometre-long grass fire is burning near Austinville. 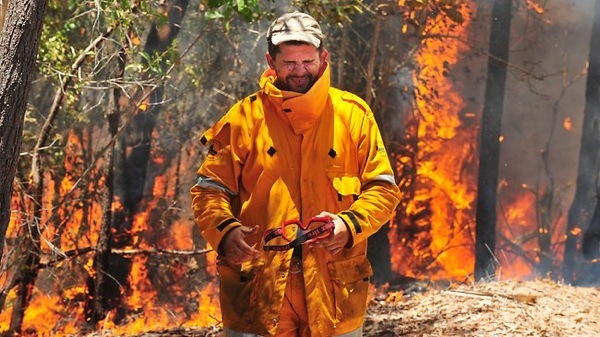 More than 200 firefighters are taking advantage of a drop in wind strength and temperatures to redouble efforts to control two fires on the New South Wales central coast, Australia. An early fall snowstorm plunged residents of northern Minnesota, USA into winter-like conditions on Thursday, slowing travel and causing power outages while also smothering the wildfires burning in the northwest. Wildfires have forced the mandatory evacuation of the south side of Karlstad, Minnesota, USA. Some buildings, which were believed to be unoccupied, were on fire at about 3:30 p.m. this afternoon. Fire crews across Manitoba are battling three wildfires that have started in the last 24 hours, but they say dry and windy conditions will pose a challenge. Wildfires in Southern California have destroyed 20 homes and threatened several hundred more in rural areas near San Diego. Fire crews battle blazes in north, north-west and south-east of Queensland, Australia. Bushfires are threatening homes near Cairns and closing down highways in the state’s northwest. Residents were evacuated from six villages northwest of Valencia, Spain on Monday. About 500 firefighters using 14 aircraft were battling the flames, which were approaching the villages of Chulilla and Gestalgar. Forest fires devastating Ecuador have left five people dead and 73 injured, consuming more than 17,600 hectares of woodland and crops. Three wildfires have caused havoc this week in western North Dakota, burning more than 6 000 acres. Firefighters rushed to protect more than 600 at-risk homes Thursday as a pair of massive wildfires threatened to merge southwest of Wenatchee., Washington, USA. The Table Mountain Complex and Wenatchee Complex fires have burned across some 70,000 acres. 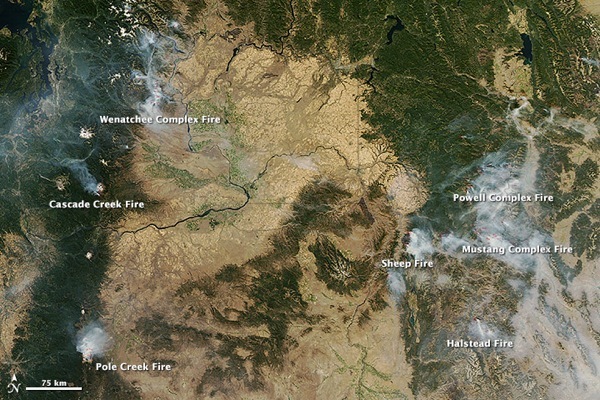 Several relatively small wildfires continue to cause problems in the Dakotas, USA. While a number of wildfires have been mostly contained by teams of firefighters, the military and volunteers, fires continue to blaze across Serbia and the Western Balkans, in what has been an exceptionally dry year punctuated by extreme heat waves. Bushfires have destroyed 33 500 hectares of Namibia’s vegetation countrywide, since the start of the southern winter.